Watch "King James" when he was still a young "prince". In 2000, LeBron still played high school basketball at St. Vincent – St. Mary High School (in his hometown: Akron, Ohio). 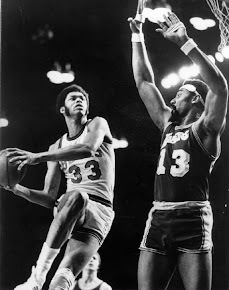 His amazing basketball talent was undoubtedly already visible and earned him a three-time "Mr. Basketball of Ohio". LeBron already scored an average of 21 points and 6 rebounds per game and developed to 25.2 points, 7.2 rebounds, 5.8 assists and 3.8 steals per game in his sophomore year. For a couple of his team's games, the "Fighting Irish" had to actually use the local university's (University of Akron, Ohio) arena to keep up with the ticket demand as everybody wanted to see LeBron showcase his amazing talent. Follow +Basketball Videos on Google+! Finally, here is a VIDEO of Saturday's 2013 Nike Hoop Summit. The international talents defeated the US selection 112-98 lead by French Livio Jean-Charles ("MVP" - though not formally granted: 27 points, 13 rebounds, 2 blocks) , German Dennis Schröder ("German Wunderkind", great talent, very quick, most likely secured a first round pick for the upcoming NBA draft: 18 and added 6 assists) and Canadian Andrew Wiggins (Canadian basketball prodigy: 17 points, 9 rebounds). On the US team, Jabari Parker stood out with 22 points, 7 rebounds, 2 steals and 2 blocks. Watch the "World Team" scrimmage feat. Livio Jean-Charles, Andrew Wiggins, Dennis Schroeder here. More details on Dennis Schroeder's performance here. Here is a nice video showing training games of the 2013 Nike Hoop Summit "World Team" that later defeated the US 112-98 lead by Livio Jean-Charles, Dennis Schroeder and Andrew Wiggins. 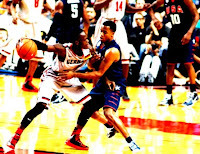 Dennis Schröder was definitely one of the stars of the 2013 Nike Hoop Summit. Germany's top basketball talent scored 18 points and made 6 assists. He drew a lot of attention and increased his chances for a first round pick at the NBA drafts. draftexpress.com currently lists him as top20 1st round pick for the 2013 drafts. Some experts compared Dennis' speed, agility and overall game to Rajan Rondo. That's definitely a better comparison than Dirk Nowitzki, who dominated the 19998 Nike Hoop Summit 15 years ago (video here. Nike Hoop Summit 1998 feat. Dirk Nowitzki). 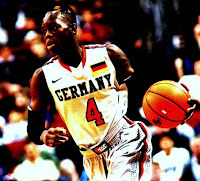 Dennis Schröder (Germany) scored 18 and added 6 assists - great game! Here is Dennis Schröder's scouting video from 2012. I think he has made great progress since then. Here is the full official scorer's report of the 2013 Nike Hoop Summit featuring the world's greatest basketball talents. The "World Team" won against the "USA Junior National Select Team" 112-98 on Saturday, April 20th at the Rose Garden in Portland, Oregon. That is the only the 5th win for the international roster and the 1st time that the World Team has recorded two consecutive-wins over the USA at Nike Hoop Summit which has been taking place for 16 years. Livio Jean-Charles (France) was the top scorer with 27 points (plus 13 rebounds and 2 blocks! ), followed by Jabari Parker (USA) with 22 points. A couple of great young players followed close: Both Julius Randle and Andrew Harrison scored 19 (both US), German top talent Dennis Schröder scored 18 (plus highest number of assists: 6). Canadian basketball prodigy Andrew Wiggins scored 17 points. Nike Hoop Summit 2013 tonight: Check out the best basketball talent! It's Nike Hoop Summit time again!.Awesome basketball talents from the US will try to beat the equally gifted international selection (incl. Canadian top talent Andrew Wiggins) again. And here are the rosters - you'll find short videos on YouTube for all of them if you want. Every year the top basketball talent from the US and around the world come together for the Nike Hoop Summit. This year - i.e. tonight (April 20th, 2013, Portland, 4pm) - we'll watch another German talent 15 years after Dirk Nowitzki dominated the 1998 Nike Hoop Summit. However, to be perfectly honest, talented Dennis Schroeder still has to work a lot on his game. Don't get me wrong. All the players drafted for the Hoop Summit are the best among their peers and have a fair chance to make it to the NBA at some point, but from the video below, it seems Dennis Schroeder will most likely not dominate the match like Nowitzki did 15 years ago - especially as Andrew Wiggins is most likely going shine again. Anyway, best luck and a great career in basketball for Dennis and the rest of the great talent! I love the Nike Hoop Summit to check out the world's greatest basketball talent. In 2011, the Americas defeated the World Select Team 92-80. The Nike Hoop Summit is always the perfect opportunity to watch the best of the best basketball talent from around the world competing against US high school basketball. In 2012, the international team beat the US team. It was their 4th victory since 1995. Dirk Nowitzki rocking the 1998 Nike Hoop Summit. Dirk scored 33 points (may of the free throw line!) and caught 14 rebounds. Amazing basketball talent and amazing performance. Nowitzki was part of the International Select Team that beat the US Basketball Junior National Select Team in San Antonio, Texas, on March 29th 1998.
Who would have thought that the German teen would later be one of the most effective NBA players? Partially due to Dirk's almost unstoppable fade-away jumper, he is not only part of the very elite 50-40-90 club (50+ FG% - 40+ 3FG% - 90+ FT%), Dirk Nowitzki has also made it to both regular season MVP (in 2007) and finals MVP in 2011 when he won the NBA championship with the Dallas Mavericks in game 6. Also follow +Basketball Videos on Gooogle+!